Manchester United have confirmed the departure of midfielder Marouane Fellaini. The Belgium international has left the club on a permanent transfer after arriving at Old Trafford from Everton in 2013 before going on to make 177 appearances throughout five-and-a-half seasons in a Red shirt. Fellaini won the FA Cup, League Cup and Europa League as a United player. He scored 22 goals during his spell at the club and was viewed as a Plan B throughout his time at United, but now he will leave for China. 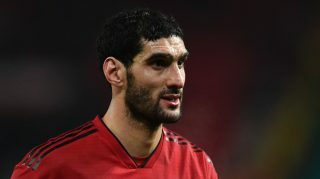 If some of the best defenders in the Premier League struggled with Fellaini’s aerial presence, he’s likely to cause havoc in the Chinese Super League. Even in the Champions League this season, Juventus did not know what to do with Fellaini when he came on as a second half substitute. Fellaini deserves credit for his time at Old Trafford, even though most of us will agree he was never anywhere near good enough to be a United player. If others downed the tools you’d never spot Fellaini doing the same because he’d only ever give 100 per cent. Everybody at Stretty News thanks Fellaini for his service and wishes him well at Shandong Luneng.